In these times in which we are living, filled with many sorrows, the only comfort for all of us is our holy Faith, with its lofty promises, radiant hope, its expectations which bring peace to the soul. For truly, never before has evil, now victorious almost everywhere in the world and infiltrating deep into the life of man and even into the fold of our Church, reached such strength, such a level of tension. We greet you, beloved in Christ brothers and sisters, with these joyous words, which consistently arouse in us a special, lofty, joyful spirit, a surge of spiritual strength, and a bright hope in a better future which awaits us. 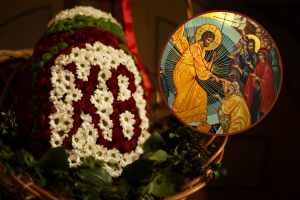 We also send this joyous Paschal greeting to you, our dear sufferers, the Russian Orthodox people who are persecuted and suffering in Russia under the yoke of cruel labor for the holy Faith, if only our voice will reach you. In these times in which we are living, filled with many sorrows, the only comfort for all of us is our holy Faith, with its lofty promises, radiant hope, its expectations which bring peace to the soul. For truly, never before has evil, now victorious almost everywhere in the world and infiltrating deep into the life of man and even into the fold of our Church, reached such strength, such a level of tension. We can only oppose this evil with our holy Faith – this evil which triumphantly proceeds along the path of lies and all manner of unrighteous deception, and which defeats people who do not believe in Truth, but rather have loved falsehood. This is the victory that overcometh the world, even our faith (I John 5:4). In this way we are comforted by the beloved disciple of Christ who stood at the very Cross of the Lord, saw all the inexpressible sufferings of the Lord, and then was vouchsafed to be the first to come to His open tomb, believe, and with His other disciples and followers, to experience the great joy of His Resurrection (John 20:2-8). Indeed this is not just imaginary, as some people superficially try to prove, who are the most unfortunate of people, stagnating in the blindness of stubborn unbelief. The truth of Christ’s glorious Resurrection is beyond the slightest doubt, by virtue of the fact that its reality was witnessed by many people of very different walks of life, who saw the Risen Christ at different times and not just once. Besides, it would be totally impossible to understand and explain differently that unusual fervor, that extraordinary animation of spirit which made the initially shy and timid apostles into brave and fearless preachers of Christ’s teaching throughout the whole world. One must keep in mind that t he Lord’s disciples, in preaching the Gospel of Christ, taught people not just empty Christian morals, but, as can be clearly seen from the Acts of the Apostles, first and foremost preached about the crucified Christ and His Resurrection from the dead on the third day, accompanying and confirming their preaching with many miraculous signs. This preaching of the resurrected Lord captured and conquered men’s hearts and made people His zealous followers, ready to seal their unshakable faithfulness to Him with their blood. Only the great truth of the Resurrection of Christ can explain the exceptionally rapid spread of the Christian faith over the whole face of the earth amid the most unfavorable conditions and situations. What else could compel thousands upon thousands of people throughout the centuries to endure indescribable torments, to shed their blood, and to give up their life for Christ? What other force could compel the rich, the noble, men of high rank, and even emperors of the proud pagan world to humbly bow down before the foot of the Cross of Christ and glorify His Resurrection? Indeed, what could compel many thousands of men and women to renounce the vain blessings, comforts, and pleasures of this world which lies in evil, and to withdraw to the deserts, mountains, caves, and precipices to live a God-pleasing life in unceasing prayer, silence, fasting, and struggles, so as to more certainly unite with Christ in the after-life, which He opened to us through His glorious Resurrection from the dead? Saint Paul, Apostle to the Gentiles, who experienced the life-creating power of the Risen Christ countless times in his astounding life, says, If in this life only we have hope in Christ, we are of all men most miserable (I Cor. 15:14), for as he himself explains, if Christ be not risen, then is our preaching vain, and your faith is also vain (I Cor. 15:19). 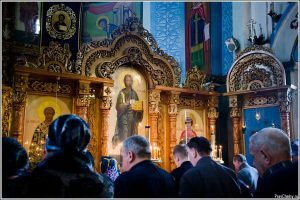 The Apostle Paul, to whom Christ appeared many times, though he was not a disciple during His earthly life, testifies with conviction: But now is Christ risen from the dead, and become the firstfruits of them that slept (I Cor. 15:20), for as in Adam all die, even so in Christ shall all be made alive (I Cor. 15:22). Then cometh the end, when He shall have delivered up the kingdom to God, even the Father; when He shall have put down all rule and all authority and power. For He must reign, till He hath put all enemies under His feet. The last enemy that shall be destroyed is death (I Cor. 15:24-26). 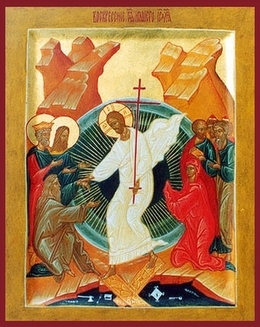 This is the very source of our radiant joy on the feast day of the glorious Resurrection of Christ. The Resurrection of Christ is for us the joyous and convincing affirmation of the final triumph of God’s Truth, the triumph over evil, the triumph over death. However, to be a participant of this final triumph of God’s Truth and to celebrate this victory over evil with Christ, the victory over death, we must be “crucified with Christ” while in this earthly life so as to join in His Resurrection. With the help of God’s Grace, given to us by virtue of Christ’s deeds, we must defeat evil (i.e., sin) within ourselves. Receiving the holy Sacrament of Baptism, we are obligated to do this. 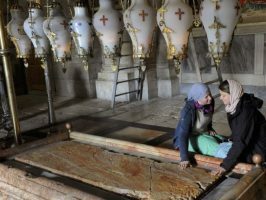 In the wonderful reading which the Church has assigned for Great and Holy Saturday, the holy Apostle Paul asks, Know ye not, that so many of us as were baptized into Jesus Christ were baptized into His death? Therefore we are buried with Him by baptism into death: that like as Christ was raised up from the dead by the glory of the Father, even so we also should walk in newness of life… Knowing that Christ being r raised from the dead dieth no more; death hath no more dominion over Him… Likewise reckon ye also yourselves to be dead indeed unto sin, but alive unto God through Jesus Christ our Lord (Rom. 6:3-4; 9; 11). This is the clear teaching of the word of God for us on the power and meaning of the great and glorious event of the Resurrection of Christ. How can one allege and teach otherwise, as do contemporary heretics, dreaming of the establishment of some sort of earthly “Kingdom of God.” They are prepared to legitimize the sinful attachment of mankind, which has betrayed the Risen Christ, to this world which lies in sin, with all its vain blessings, comforts, and pleasures. “…From earth to heaven, Christ God hath brought us…” by His Resurrection, so how and why, after this, would we return to earth, from which we have been torn away, although temporarily we must continue to walk upon it? To rejoin ourselves to the world [i.e., earthly things] is callous ingratitude to the Risen Christ, an audacious mockery of the holiness of His Resurrection! No! If we Christians are not “Christians only by name,” we must do away with earthly life, filled with sinful passions. “We celebrate the death of death, the destruction of hades, the beginning of another life eternal…,” and all our thoughts and feelings must be directed toward “the unwaning day of Christ’s kingdom,” which awaits us, and toward which we must strive with our whole heart.